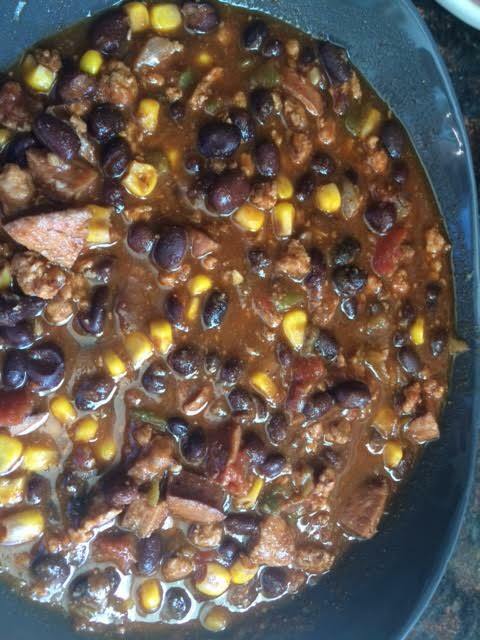 Andouille Sausage and Black Bean Chili | Om nom nom! 1 bottle of beer – I used Shiner Bock, which is my go-to for cooking with beer, but you could use anything. If using a slow cooker, brown turkey and then add all ingredients to the slow cooker, mix well, and cook 4 hours on high or 6-7 on low. If using a dutch oven, heat oven over medium-high heat. Add sausage to pan; sauté 3 minutes or until browned. Remove chorizo from pan. Add turkey to pan; sauté 5 minutes or until browned. Add onion and garlic to pan; sauté 3 minutes. Add spices, stir, and cook for about 30 seconds until fragrant. Stir in the rest of the ingredients and bring to a boil. Reduce heat and simmer for an hour or so. Remove from heat and check seasoning; serve with chili fixings.